You have gone on an Introductory Flight and you have been bitten by the bug…you NEED to fly. Do not worry, it happens more often than not! The next step is to begin training to achieve a Private Pilot license. Becoming a private pilot requires hard work and dedication, but it will be a fulfilling endeavor and an incredibly fun one at that! Once you commit to training you first will be paired with one of our highly-experienced flight instructors who one-on-one will take you through the entire process. We will make this match based on your personal schedule and your own unique personality. Training will consist of both classroom sessions on the ground as well as sessions in the aircraft. Flights will consist of both instructional flights and solo flights. Upon completion of the training you will take a license exam. The flight training may be conducted in our C172M, Piper Warrior II, or Piper Warrior III. 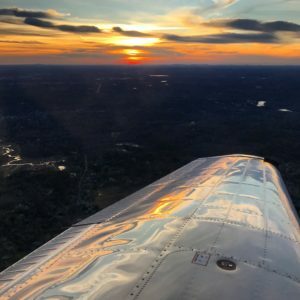 What Can You Do With a Private Pilot License? Put simply, as a Private Pilot you may operate an aircraft (own or rent) for pleasure or utility during periods of good weather. You may not, however, profit directly from flying. In other words, you can not get paid to fly. Put even more simply, pack the airplane up with a friend or two on a nice day and fly to Martha’s Vineyard for lunch! Keep in mind that the above are the minimum requirements set forth by the FAA. Multiple factors will determine the actual number of hours necessary to complete the training. Based on current FAA data, nationwide the average student pilot will achieve the license in 65 hours of total flight time.